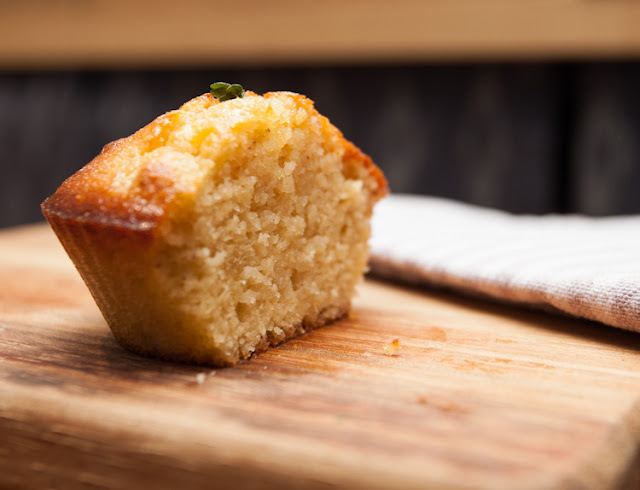 mini almond lemon thyme cake. I love all things citrus, so it only makes sense that I love this herb called lemon thyme, with its refreshing fragrance and flavour, reminiscent of lemon zest, but with an additional, elusive herbal allure. 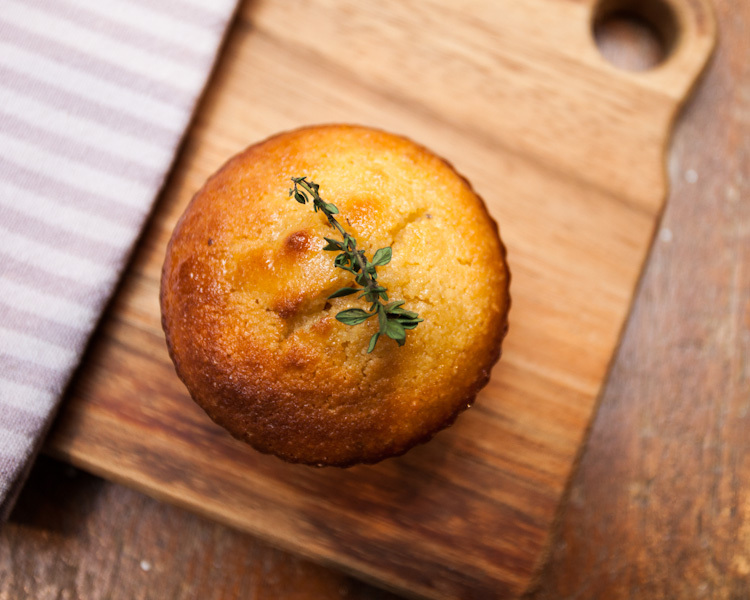 I had recently stocked up my pantry with some almond meal, which was just begging to be used in a baking project, so when I subsequently picked up a sleeve of lemon thyme from the markets not too long afterwards, the conclusion was clear: mini gluten-free lemon thyme almond cakes was the answer. For my almond cakes, I decided to first create a lemon thyme syrup which does triple duty - it goes into the batter, pours over the cakes to finish, and the leftovers are beautiful as a cordial (which tastes remarkably like a more wholesome homemade version of the popular Australian lemon squash soft drink, Solo). Prepare lemon thyme by trimming and discarding the roots. Give them a good rinse to clean, then snip each sprig into sections so that they will fit in the saucepan later. Bring water and sugar to boil over medium heat, stirring to dissolve the sugar, then continue to let it boil, uncovered, for 2 minutes. Turn off the heat and immediately immerse lemon thyme sprigs in the sugar syrup. 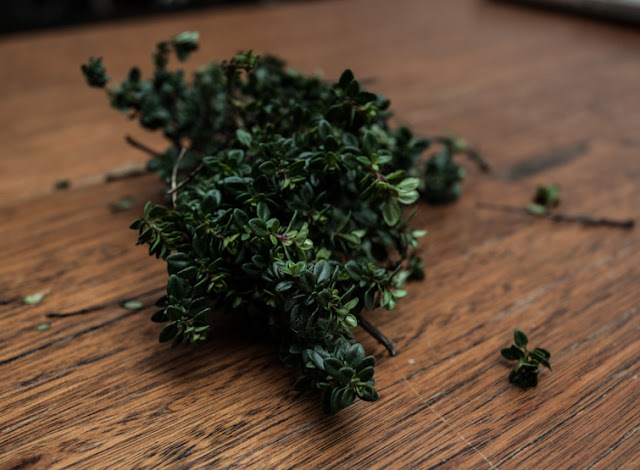 Press down the lemon thyme so that the sprigs are completely submerged, and lightly bruise the leaves with a pestle or muddler. Cover and steep for 30 minutes. Add lemon juice. Continue to steep for another 2 hours - preferably overnight for a greater flavour intensity. Strain before using. This will make more than enough lemon thyme syrup for the cake recipe below. Just know that the syrup also makes a pretty awesome cordial. I mix it with cold sparkling or soda water to create a refreshing fizzy lemonade! *I suspect other lemony herbs such as lemon verbena, lemon myrtle, lemon balm could work as substitutes. Otherwise, perhaps a couple lemons' worth of zest plus a few sprigs of regular thyme? 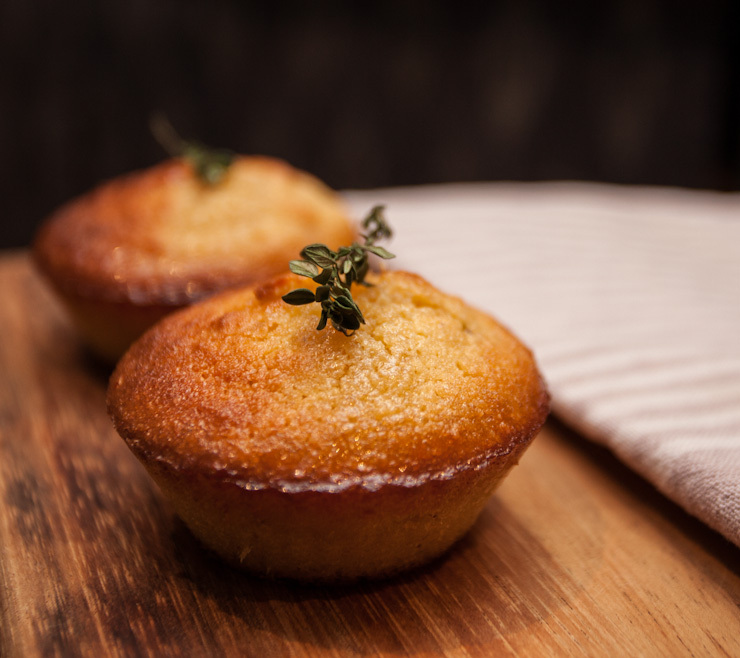 mini lemon thyme almond cakes. Preheat oven to 160°C/320°F fan forced (180°C/350°F conventional). Mix almond meal and baking powder in a bowl. Blend lemon thyme syrup, eggs and salt until smooth. Combine with almond meal mixture, stirring. Let the mixture sit for 5 minutes to absorb and thicken, then stir again to combine. Divide the batter into 6 greased muffin cases. Bake for 20 minutes or until golden brown. Remove from oven, prick the tops with a fork and trickle in about 2 teaspoons syrup for each mini cake. Let them cool for at least 10 minutes before carefully removing from cases. These mini lemon thyme almond cakes should keep for at least 2 days in an airtight container on the counter, or 4 days in the fridge. Serve on their own, with a cup of tea, or with a refreshing dollop of yoghurt, sorbet or ice cream. cross section of mini lemon thyme almond cake. Oh yum! I adore lemony things - I used to eat lemon balm by the handful out of the neighbor's garden every year in the summertime. These cakes look incredibly good, and the cordial sounds fantastic. I would so love to have access to a garden with lemony herbs. This is honestly, honestly, honestly pretty much my favourite thing I've seen in a squillion moments. Lemon dessert, almond dessert, "savoury" herb in dessert.... oh I want it, I want it! Gorgeous. Your use of flavours is amazing as always! Thank you! It's hard to go wrong with lemony goodness. oh, oh, oh! i've had lemon cakes on my to do (to bake?) list for a while, and these look gorgeous! My only problem is that the lemon thyme has died down for the winter here in hobart. but my mum has lemon verbena, which i think is somehow lighter and sweeter smelling, so i may get some next time i see her and try that version. thanks for the nudge. Delicious! I love this flavor combination. Looks like just the friday afternoon tea snack I'm craving. Agree. Citrus cakes are fantastic! Okay, I have to try this lemon thyme! These look so beautiful, I love the hue on the cakes. It's such a nice golden colour, isn't it? And the syrup gives it a pretty sheen, too. That lemon-thyme syrup sounds absolutely incredible! I can think of so many uses. More than once I've opted out of a chance to buy lemon-thyme at the farmer's market, because I never knew how I would use it up... now I know! And these cupcakes would for sure be top of the list. Aw thanks! :) I do recommend trying out some lemon thyme next time you see them. They would also be lovely in savoury dishes like a roast chicken with potatoes. Your lemon thyme almond cakes are now to blame for the few pounds I'm sure to gain by eating an entire batch by myself (which I intend to do tomorrow as soon as I purchase some almond meal). OMG they look and sound beyond tempting. Thank you, I think, for this new treat. I didn't plant lemon thyme this year, but I have in the past. I bet these little muffins are really good! Perfection, I must make these immediately! They are so cute :D And a triple duty syrup - most excellent. Oh they look just simply gorgeous!! Great flavour combinations! I love the moreishness of almond meal in cakes - and any lemon flavored cakes - yum! I find almond meal quite moreish and filling, too! I love thyme. It goes with nearly everything :) I am always on the look out for gluten free recipes. They are much harder than people assume! Fantastic!! I am in France right now and seeing all these bags of almond meal in the supermarkets and the herbs all around (I am in Provence) make me want to bake these little beauties asap! Oh, lucky you, I would love to be in France! I am also very much a citrus fan so I think I would definitely love these cute cakes ^^ I'm sure they would be bursting with flavour since you've put the syrup in the batter and over it.... mmmm. I recently tried thime in tea. It adds a great scent and flavour. I never thought it could match well with sweet taste. I'll try this recipe! It definitely matches! Just a note, though, lemon thyme is different to regular thyme. Lemon thyme is not as strong with actual thyme flavour, but it's zingier, zestier. Nice to meet you! :) Just a word of caution though - regular thyme won't achieve quite the same sharp zingy effect here as lemon thyme. Your photos are looking gorgeous, I love the first photo! Mouth is watering for afternoon tea already!